What an amazing weekend! One of the busiest for sure. On Saturday I was honored to paint live at Katherine and Manny’s wedding reception. The reception was at the beautiful North Ridge Country Club (NRCC) in Raleigh NC. The club is not too far from where I live. I have been traveling for assignments, so, this was a good change. 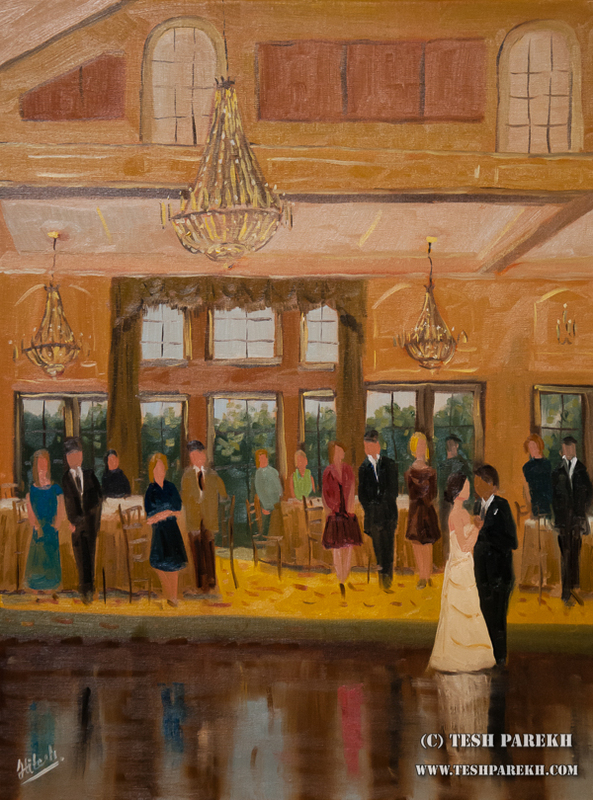 This was my third wedding painting commission with A Southern Soiree. Many amazing vendors made this wedding reception absolutely beautiful. Katherine had a certain vision for this painting. My aim was to create a painting that will meet her expectation while allowing me the artistic freedom. This commission was originally of 16×20 size. When I arrived at the location I decided to paint bigger size of 18×24. This size allowed me to create a composition that captured what Katherine had in mind. And I was able to incorporate elements that described the venue, event and most importantly couple’s very special moment- their first dance, in sufficient detail. I arrived at the location three hours prior to the first dance. A Southern Soiree team had already suggested a location that will be appropriate for me to setup. As with many of my live painting commissions, my painting was created from the vision I had and not the actual view from where I was setup. To achieve that I move around and create reference sketches. My aim always is not to create a literal painting but work-of-art that captures the special moments. Live wedding painting in progress at the North Ridge Country Club. I have finished toning the linen and sketched my composition. 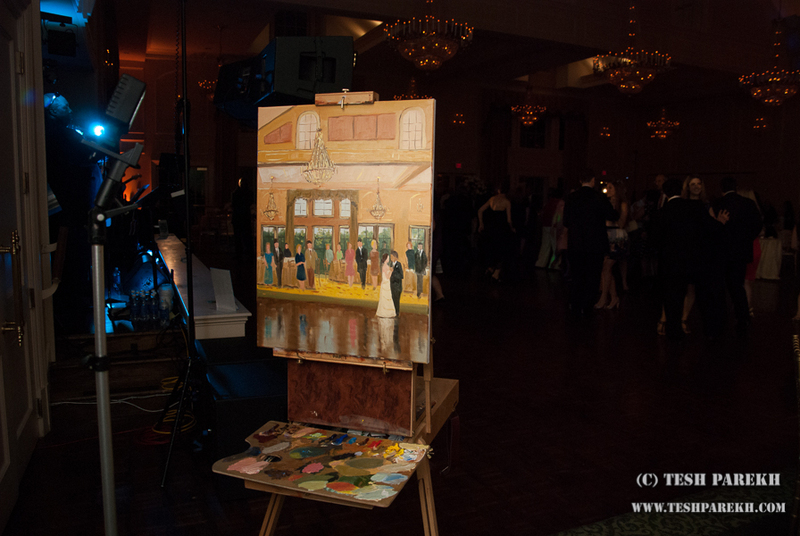 Here is my finished live painting of the first dance on easel. I informed Megan of A Southern Soiree that the commission was complete and can be presented to the couple for approval. I was fortunate to have Chrisobal of Azul Photography present when painting was presented to Katherine and Manny. The couple was simply amazed! And so were the family members and wedding guests. I look forward to seeing those amazing images! First dance of Katherine and Manny. 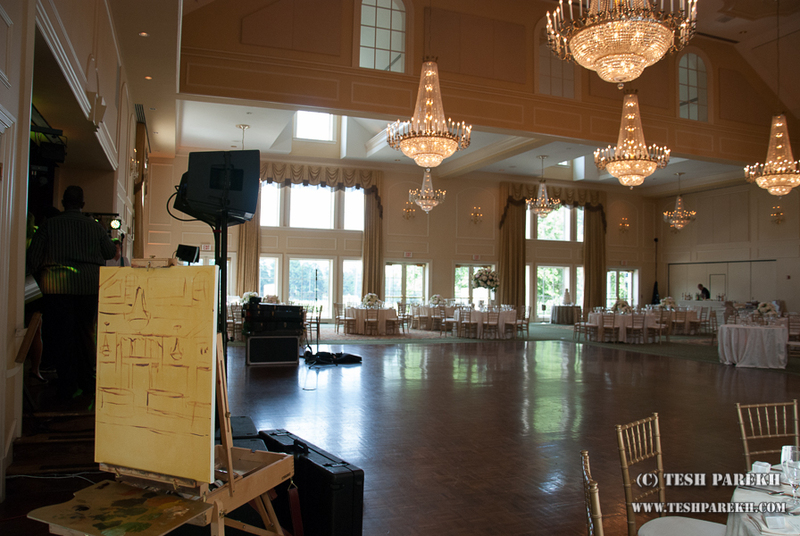 Live wedding painting at the North Ridge Country Club in Raleigh NC. 18×24. Oil on linen. My next commission will be in VA. And a studio wedding painting commission from very popular and beautiful local venue is very likely soon. So, if you are already married or are looking for a gift for someone who is already married- think of commissioning me to do a studio painting from wedding photos.